Ok, well, almost a year. Up until this past year, tea has been my hot drink of choice. I’ve tried coffee SO MANY TIMES over the course of my life, but it has always tasted rather bitter to me, no matter how much sugar and whipped cream I added. I didn’t even like coffee ice cream! I don’t know if my taste buds have mellowed over the years or what, but coffee finally tastes good to me, even without being as sweetened as a Starbucks Frappucino. So, here are eight things I’ve learned in my brief coffee-drinking career. 1. 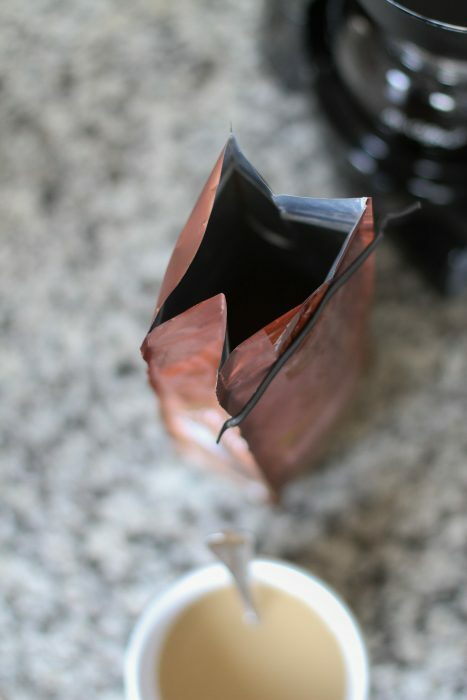 Home-brewed coffee can be very inexpensive. A pack of filters and a bag of grounds cost pennies per cup, even if you’re buying something fancier than Folger’s. It’s a very frugal indulgence. 2. Home-brewed coffee produces very little trash. I compost the filters and grounds and I drink my coffee in a reusable mug, so the only trash is the bag that the grounds come in. 3. 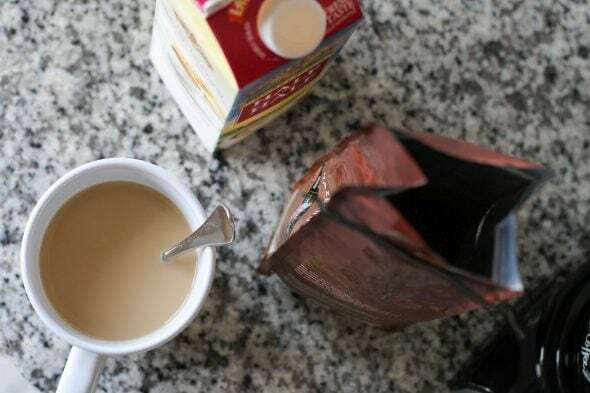 Making basic coffee at home is very, very easy. I’ve seen Joshua do plenty of fancy stuff with coffee that is pretty time consuming. But for my commoner-level coffee tastes, I just need a basic brew, and that takes almost no time. Email subscribers, click here to access the link, which will not work via email. 4. I am a little bit picky about my store-brand coffee. My coffee snobbery is nowhere near the level of Joshua’s (he works in specialty coffee as a barista), but I discovered that I do not like a lot of store-brand coffees. Apparently I have a slightly discriminating palate. 5. Aldi’s coffee is stupid cheap. And it tastes good! Their bags of coffee grounds are just a couple of dollars, and I think they taste way better than most store brand coffees. Related: Joshua kind of cringes at this, but Lisey and I really liked all of Aldi’s fun holiday coffee flavors. 6. I still do not like black coffee. I need a little sugar and a hefty splash of half and half or heavy cream when I drink coffee, just like when I have chai. But you never know! Maybe my taste buds will get even more accepting one day and I will become a black coffee drinker. 7. I don’t like super sweet coffee. I think it’s sort of like how I feel about milk chocolate; there’s a point where it gets too sweet and it no longer tastes quite as good to me. So, no black coffee for me, but I’m also not interested in caramel marshmallow brown sugar iced coffee with a chocolate drizzle. 8. I don’t need coffee every day. If I’m at home, I generally have a cup every morning. But if I’m out of town or don’t have time to make coffee, I don’t really find that I feel very different. I don’t drink it for the caffeine hit; rather I drink it because I like the taste, and I’m happy to know that drinking it daily hasn’t made me dependent. Phew. Are you a coffee drinker? If you are, any tips for a semi-newbie like me? I am also a semi-newbie like you. No tips. I have it about every other day now–sometimes more, sometimes less. But I still love my Earl Grey. I drink both with cream, no sugar. I’m not fond of it black either. Maybe sometime I’ll turn into my mother and drink it very weak with maybe a bit of extra water; that’s her “black” which is really just brown. If you buy whole beans and keep the bag in the freezer it does taste better … I’ve no time to do actually do that and I wake up early enough that the grinding would wake everyone haha so I buy ground. I’ve been drinking coffee since I was 12, I could probably go without the caffeine itself but the act of brewing/sipping the hot creamy coffee I do as soon as I wake up or I’m very cranky. I can’t do store brand … I’m loving the blond Starbucks blend. I’m still not a coffee drinker. I purposely didn’t pick up the habit when I first started working so that I would be involved in any of the coffee disagreements (who didn’t clean the pot, who hasn’t taking a turn buying, etc.). And I still don’t drink it because of the taste. However, I love the smell. I always say when it tastes as good as it smells, I start drinking. I also like the aroma but can’t stand the taste, so maybe I’ll steal your clever comment sometime. My first coffee at age 12 included a very sweet roll followed by a 40-mile trip on a very bumpy road. Not a good combination. So anyway, I realized if I’m at an event where one should politely drink coffee, they’ll usually always be serving tea too. I don’t drink coffee either but on my first job I was told everyone had to clean the pot whether you drank it or not. Being young (and slightly stupid?) I washed the entire electric pot. Naturally they had to buy a new pot and no one ever asked me to wash it again. Bobi, this made me laugh so hard…I don’t drink coffee and have never used a coffee pot in my life and I can imagine myself doing the very same thing! I am the same way. I always wonder how something can smell so good and taste so bad. I have tried coffee several times and have never enjoyed it. Oh well my husband doesn’t drink it either so we’ve are a perfect match! I started drinking coffee to warm up after walking across campus in college and now it’s become a matter of drinking it to relax and as part of my routine. I’m on an anti-Candida diet so coffee is off limits now due to the caffeine and acid, but I have found an excellent replacement with Teeccino chicory root. For me, it takes like a combo of coffee and cocoa without the bitter notes. Not that filters are super expensive or anything, but you can eliminate buying them as well. We use a mesh reusable basket that replaces a filter and it’s been going strong for years! I’m pretty sure we just picked it up at the grocery store from the coffee aisle. And I second your opinion on Aldi coffee, it’s delicious! Glad I searched “filter” before making this comment, although I stopped when I found Amie’s above, so perhaps someone else has shared this information as well? 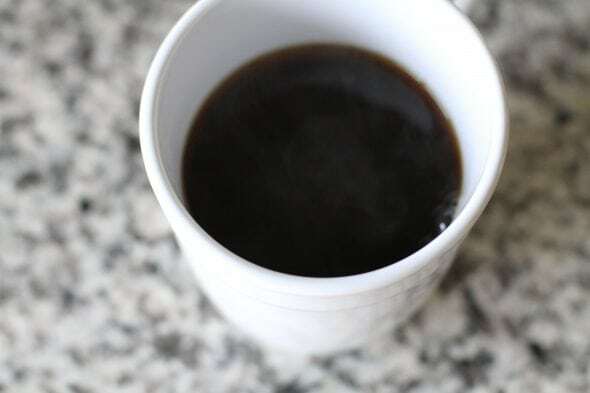 Another reason for buying a reusable mesh basket is because coffee can cause heartburn, but also contains an oil that reduces or eliminates heartburn! Unfortunately, a paper filter absorbs that oil, and probably other beneficial oils (like flavor enhancers) as well. When I filtered my coffee, I bought a mesh basket that was gold plated! It was very inexpensive, and was supposedly superior to others. I composted my paper filters, but appreciated not having that extra cost to each cup. And, being prone to heartburn, I liked not worrying about getting it from my daily cup! I do not drink coffee at all. I tried to drink it when I was up early studying for tests in college. The warm, sweet(I needed lots of sugar) liquid would make me want to curl up and go to sleep. My whole family has always drank coffee as if they had to have it each morning. I guess that’s why I never wanted to start drinking it. I don’t want anything I have to be dependent on. I am quite crabby first thing in the morning so maybe that caffeine hit would help. I don’t want to add anything else to do during my mornings so I purposely have tried to avoid for that reason. I just read all the comments. I am the only one that does not drink coffee at all. I always knew I was a bit strange, lol. You are not alone or strange for not drinking coffee! I don’t ever drink it either and neither does my spouse. Millions of people in the world do not drink coffee but it does seem to be a minority in the USA. I think it is awesome not to have the addiction to it. It is so great to be able to travel and not worry about where you’ll get the next coffee fix! Oh yeah, I don’t think it’s weird at all to not drink coffee. And I agree about getting a fix…which is why I’m so relieved that it doesn’t seem to matter to me at all if I have coffee or if I don’t. I loathe the taste of coffee. It’s the nastiest thing I’ve ever tasted, which is saying a great deal. I don’t even like the smell. For the record, I have been to plenty of events that had coffee but not tea. I was more-or-less the guest of honor at once of these so I ~had~ to accept a cup. I made sure to sit next to the plant. You’re not the only one. I love the taste of coffee, and wish I could drink it, but it gives me migraines. And it messes with my sleep even if I only drink one cup in the morning! I keep a little cold brew in a bottle around in case I get a migraine–the caffeine can sometimes help my medication work better. My husband has never drank coffee in his entire life, I guess because his parents never drank it so he never got exposed to the idea? Even the smell of coffee, he says, makes him feel hyper-stimulated. ! When we got married my mother was scandalized that we didn’t register for a coffee maker. I pointed out that neither of us drank coffee, and she said “what about guests? !” So far, we haven’t had any issues! I too, enjoy my coffee for the taste of it as opposed to the caffeine hit! For me, my cup of coffee is a moment to relax in my hectic day, a moment to slow down and just…be. I used to have that Mr Coffee machine as well! It got me all through college and my first couple years in the professional world before I upgraded (I use the Ninja coffee maker now). 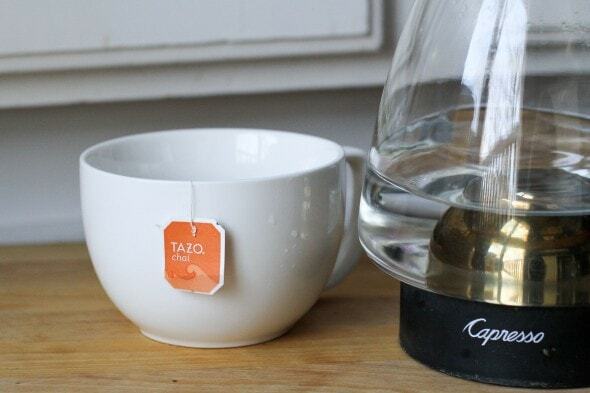 It’s so funny that you switched from tea to coffee. I just switched from coffee to tea. I had to have my gallbladder out on black Friday and two weeks before that I was noticing that I was starting to dislike the taste of coffee. Since having my gallbladder out, I can’t stand coffee! So strange. When I had my gallbladder out, my sweet tooth when from Augustus Gloop levels to pretty nonexistent. I agree, strange! Awwwww… It makes me smile that you’re a coffee drinker now! I’ve been drinking coffee for half of my life. (I turn 33 next month.) 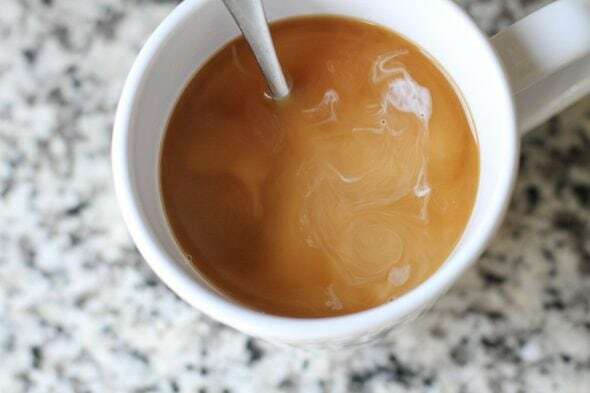 I drink it with flavored creamer, though the amount I need has decreased over the years and I don’t need very much at all anymore. I drink the cheap-o Aldi coffee… No coffee snob here! I’ve converted my husband to coffee in the last year (as we added a third child to our family). You’re so right – such an inexpensive indulgence! And I agree about chocolate milk, too. I usually mix in a little white milk to bring it down. I am a coffee drinker – started in college. I have always liked it black! When I was a kid I watched how family members at weddings or restaurants often had to wait for the waiter to bring cream or sugar – sometimes the coffee was cold by the time cream/sugar arrived – and I vowed to only drink black coffee because it was the simplest (added benefit of no calories – or cost!). Drink 2-3 cups in the morning before I leave the house, and nothing after that. Ahh, interesting! Maybe I should get a French press. A french press works best with coarse grinds, though. With regular finer grinds, you get quite a bit of sludge in your cup. Must depend on the french press – I grind mine quite fine (‘fine” on the Trader Joes or Costco grinders) and never get the sludge! Sometimes I have to be careful pressing down the top/filter- when coffee is finely ground it can put up some resistance- I do find that if you wait a few minutes the grounds settle on their own (gravity) and then there is little resistance! If you have an IKEA nearby, they have lovely cheap French presses! I frequently see French Presses at Goodwill. I just saw one at my local Goodwill about a week ago – new in the box. My house is funny and not frugal with coffee. My husband uses a Keurig on the weekends but buys coffee at Dunkin Donuts on work days and drinks it black either way. I use a Nespresso + milk frother at home for lattes with one splenda which is cheaper than buying it out but still about $1 per cup. Once a week or so I hit Starbucks when I am in the office. My son drinks no coffee. My older daughter drinks iced coffee. Either I brew her one in the Nespresso or she gets Starbucks or Dunkin. She is lactose intolerant, so she tops it with either soy milk or lactose-free milk plus sugar free vanilla syrup. My younger daughter likes a very sweet coffee now and then – iced caramel machiatto, hot caramel brulee latte from Starbucks. She was drinking an iced coffee every morning but it made her anxious, so this is a couple times a month treat now. She does like hot tea though! Maybe this is worth trying for your younger daughter – I love the taste of any coffee – drip, black, cappuccino, espresso, french press and the fancy creations at Starbucks with many delicious calories. But I can really only have one cup in the morning, otherwise I get jittery and my sleep quality suffers. Fortunately, at Starbucks, you can get any drink made with decaf, so if I want to treat myself to a caramel macchiato WITH cream of course, I go for the decaf. How much does all of that run these days, and is it worth it? I’m not judging, just thinking! We all make our own choices; this may be a teachable moment in your family! I was very late to coffee drinking. I didn’t start drinking it until I was about 25 years old. I didn’t drink tea either. I guess I was just a water drinker. I don’t really remember why I started, but I have VERY specific requirements for my coffee. I buy Community Coffee from Louisiana, because those are my first memories of coffee–cafe au lait at my grandmother’s house in New Orleans. I make it very, very strong and put in quite a bit of milk, because that’s how you make cafe au lait. I used to use sugar, but don’t anymore. And now I must have the raw milk from the Jersey cows on the farm up the road, or it doesn’t taste right. This may be the only area in my life in which I am high maintenance. That said, since having four children in ten years–meaning not having slept properly in a decade–I have found I drink more coffee (three cups in the morning now), and will drink sub-standard coffee on road trips or what have you just to get some caffeine in me in the afternoon when I’ve been up since 3 a.m. and have hours to go before I sleep. I realize this is not ideal, but that’s the way it is. Oh, and now I use a french press. No filters or brewing through plastic. Definitely high maintenance. Aw, what a lovely memory — cafe au lait in it’s natural habitat — i would never switch, either! I like its flavor better than the French Press. It uses small filters, but we always use each one twice, just rinse it out in between and dry. I also started drinking coffee late. Oddly enough it was one of my pregnancy cravings at age 29. Recently I cut back my sugar intake so now I drink my homemade coffee with a splash of original soymilk and a sprinkle of cinnamon. We use a Keurig with the reuseable mesh pods and I buy coffee when it’s on sale, typically $6.99 for a 875g tin. I quite like Superstore’s President’s Choice Gourmet West Coast Dark Roast. I love the word coffee and when I see someone in an advertisement or even a character in an illustration holding a cup of coffee, I immediately want one. Two is my limit. It makes me feel productive, alert and warm. Yay coffee! (I love tea too but it has its own special time and place). I have also picked up a daily coffee habit over the past year. I drink a cup each morning with cream, no sugar. I mostly have a cup at work (my company serves up a tasty, rich brand) – so no big cost for me. At home, I have a simple french press and I keep a small bag of good ground coffee and half-and-half in the fridge. My family are still tea drinkers. I started drinking it when I was 37, pregnant with my daughter. I know, I know, you are supposed to GIVE UP coffee when pregnant!!! I had horrible insomnia the entire pregnancy and two other kids to care for, so it was needed. I drink it black, and am not picky about coffee at all. It was the hardest thing to give up when I went AIP for health reasons – strangely addicting. It was the first thing I added back in and have enjoyed my morning cup ever since! Pot of black coffee every day is my life! Since college. There is nothing more comforting and warm and wonderful than a cup of steaming hot black coffee. I am picky but not uber picky about brands. Costco medium roast is very good! I like it, but if I were told I couldn’t have it that would be fine too. My husband is the big coffee drinker in my family, so I’ll sometimes pour myself a cup if he’s made a pot. No sugar but a lot of half and half. And I mean a lot. I think my favorite part is holding the warm mug in my hands! My coffee ends up being a pretty blonde color, so I understand the amount of half and half. We always make coffee at home, and still not as fancy. Our coffee pot/system has a timer so I set it up the night before and it’s made in the AM. I also use a re-usable filter. You can find them in all sizes and styles. Saves on the paper ones and no waste of the filter (saves some pennies!). Don’t know how it goes when emptying for compost tho as I’m sure using a filter is easy! I started drinking coffee whrn I worked in Manhattan many moons ago. I went from full fat milk & 3 sugars to healthy coffee with spices and coconut sugar. In a pinch, I like the new natural creamers that already come with a little sugar in them. I like my coffee light and sweet, but it has to be milk and not half and half. Also at Christmas, instead of cream, use egg nog. Oh my goodness!!!! My ultimate favorite!!! That is a good point; it’s so easy to lift the filter out and put the whole thing into the compost bucket. It’d probably be a little more annoying to get the grounds out of the reusable filter. Hmm. Long time coffee drinker here: I’ve used both reusable and paper filters. The paper filters, in theory, help to filter out some of the acid in coffee as it’s brewing (which can make it taste a bit sour). I can usually tell a difference when I drink coffee made with reusable/paper filters, but I also drink my coffee black. With cream and sugar you might not notice either way. We also compost, and if you go with a reusable filter, I would suggest you let the grounds dry out in the filter for awhile before you dump them out. We found it makes less of a mess that way. Ahh love me some coffee! I’ve been drinking it since senior year of high school. I can function without it, of course, but I consider it a wonderful daily indulgence. If you do French press coffee, there is literally zero waste other than the coffee grounds. Hubs has turned me into a total coffee snob; I can’t go back to Folgers! I will say the key to good homemade coffee is quality whole beans. We buy the dark roast and grind them fresh each batch. It’s extra work, but MAN does it make cafe-level coffee. I always have a cup of coffee in the morning, and then tea the rest of the day, switching to herbal about mid day so I’m not up all night. If I don’t have coffee in the AM, I end up with a headache around 10 am, bad news! I don’t have a Keurig because I hate the waste aspect, but I do have a coffee maker that makes a single cup- it has a reusable filter that you just drop in your scoop or so of coffee, and it brews like a normal coffee pot, but then I’m not tempted to drink an entire pot or have to throw away extra coffee. I go through less coffee, and no waste other than the grounds, and the filter is easy to clean, a quick rinse in the sink. I sometimes get ambitious and buy the whole beans and freeze them until I’m ready to grind enough for the week, but most times I go with the easy way and buy pre-ground. Sprouts has some amazing flavors of bulk coffee, and surprisingly, Walmart has a house brand creme brulee flavor that is really good! One fun tip is, when I’m feeling extra sassy, I throw some cinnamon in with my grounds before I brew it- so good! My body is the type that demands exactly the same amount of caffeine daily or it revolts. I do love my coffee! I generally drink it black, just a little cream occasionally or sometimes sugar. I’ve been a coffee drinker for a long time now! I have a glass pour over maker. Love it! It makes the best coffee! Flavored coffees are not my jam. I just want my coffee to taste like coffee! I’m such a dolt….I saw a Chemex at Goodwill and didn’t buy it. That was maybe six months ago, and I still regret that. I love Aldi’s coffee, also. I like the taste as well as the low cost. I also appreciate that the unflavored ones I buy are Fair Trade Certified. My feelings on coffee are like those on wine. Why should I try to train my palate to like the more expensive ones. I am happy with my taste-buds as they are. I didn’t start drinking coffee until I was in my 40s! Although, unlike you, I have always liked coffee ice cream (except when they grind up the beans and put it in the ice cream. I don’t want grounds in my drink, why would I want it in my ice cream?!? But I digress . . .) I started drinking iced coffees a few summers ago (with lots of cream and sugar – I may as well just have the ice cream) and bought a French press for making coffee concentrate for that. Now I drink hot coffee too, but because I like so much sugar and cream, I limit it to once a week – usually on a weekend morning. I have found that over time I add less and less sugar and cream. Maybe one day it won’t be the calorie bomb it is now. Kristen!! How cool! We have the same coffee maker! I am the only coffee drinker in my house and so I just have a cute little one. That timer feature is awesome, huh? Welcome to the world of coffee! I’m not surprised that you don’t like a lot of store-brand coffees. Not only is taste an issue, but so is environmental stewardship. High-end and environmentally friendly don’t always go hand-in-hand, and likewise for cheap and environmentally unfriendly, but you may find you prefer spending a little more for a better quality coffee that is better for the environment! Have you ever tried Vietnamese coffee? I would recommend trying one (hot or cold is awesome) in a restaurant. I love it and maybe have three to four a year–a special treat when the opportunity arises. Amazon also has Vietnamese coffee-making kits that have tempted me, but that I have not yet caved to get. PS: For years I have wanted Hungry Harvest because of your awesome posts, but I have been bummed that they haven’t expanded West. Then I stumbled on Imperfect Vegetables right before you posted about it, and they do serve my area! I love that we are on the same wavelength about these things! I’ve never even heard of Vietnamese coffee. I’m going to have to google that. Vietnamese Coffee is dessert – lots of cream and sugar OR lots of condensed milk, a little coffee at the bottom; often iced. I saw it drunk black or at least not sweetened to dessert levels when I was in Vietnam, but it’s another matter entirely in the US. I prefer tea as well, but will occasionally drink coffee. Café Bustelo, in the yellow brick at Aldi, is delicious! Try using a percolator or French Press, no need for filters. Well, count me as one of the few who never drank it, never will. I tried, I really did, as both of my parents loved coffee, but I would taste it and spit it out in the sink. I tried later as an adult, and had the same results, trying it black, then with just milk, then milk and sugar. Out of my siblings and me, none of us drank coffee until middle aged, and I still don’t. The ones that do, drink very, very little, as in a cup once a quarter-year or so. Coffee tastes bitter to me and I can’t stand tiramisu, coffee ice cream, coffee candy, mocha flavored anything — you get the drift. I was not happy a few years ago when coffee flavored everything was popular. My husband loves coffee, drinks it black and unsweetened and has for all of his adult life. He likes it dark and strong. I buy different coffees for him, some ground, some not, but I usually try to get organic, and always try to get fair trade. His tips are to make a full pot and refrigerate what you know you won’t drink up that day. He says it is still good the next day, once reheated. 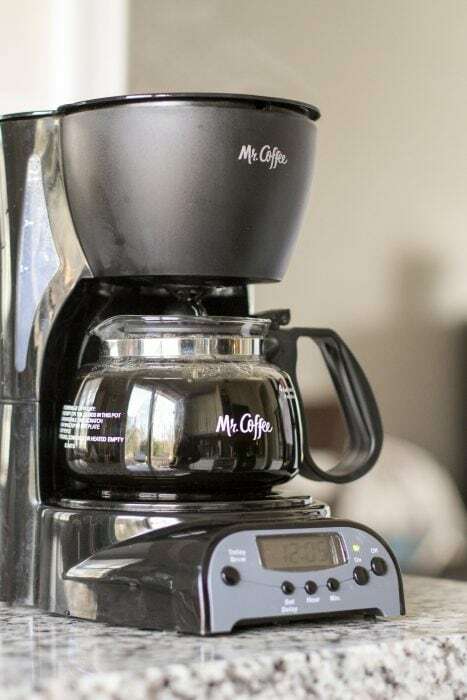 He also, when running low, will re-use the grounds from the previous day by adding half the amount of fresh grounds that he usually uses to the grounds still in the coffee maker from the previous day. He says it still makes a good cup of coffee and saves on grounds, too. I can’t vouch for any of this, since I never taste it. It does smell so good! And yep, Lisey and I totally do not mind drinking leftover coffee. Joshua is vaguely horrified by the idea, but we are just not very picky. Ha. I drink 1-2 cups of coffee a day. We are a very frugal and minimalist family, but my husband and I do splurge on coffee. We only buy Finger Lakes Coffee Roasters (roasted in Western NY!). We wait till the 9th of the month when it goes on sale for $9.99 per lb. We found that buying flavored, quality coffee prevents us from buying coffee out. I put organic half and half and raw sugar in mine, but my husband drinks it black. I recently started making a big pot of coffee, adding cream and sugar, and putting it in a large mason jar in the refrigerator. Every morning I just pour over ice for instant iced coffee. Saves time in morning and money on iced coffees at a shop. Even kind of expensive coffee beans are still so, so much cheaper than getting coffee in a coffee shop. So, spend away, I say! I have no hints — just narrative. My favorite beverages are coffee, Pepsi, milk and beer. Five kids means I have as much coffee and milk as I want (separately, only rarely merged; black coffee is my favorite) and one Pepsi and one beer a day — unless I’m in a phase where I’ve given up the Pepsi so I don’t have that cost and extra calories, which is most of the time. We have a secondhand Bunn that holds hot water at temp until you use it. This is a cute feature that I could do without, but it is handy for first thing in the morning or when the neighbors drop in — unless I’ve unplugged it in a (possibly misguided; somebody ask Amy Dacyzyn to calculate this for me) effort to save money, which is most of the time. To conclude this near-random list, I drink way too much coffee. The Bunn makes a short 12 cups and I can drink a pot and a half in no time. I don’t like water. This is a very bad combination of factors for things like muscle- or dehydration-related headaches. Started drinking coffee at 40. I’m not dependent on it for the caffeine, but I just love the ritual of it. Slowing down to sit and drink my latte. I don’t like plain black. We have 2 of the best coffee houses in town that I’ve ever had. They both roast their own beans. Starbucks is to sweet, but if I’m out and about and that is all there is, I will get one there. I do grind my own beans and I am a snob about those. I don’t add sugar, but will add Hazelnut or Coconut flavoring/creme. I love hot tea also though, so I will have a cup of that at night sometimes. I found a few years ago that brewing coffee in my Chemex pot made my coffee taste less bitter, and the oil didn’t give me heartburn. Of course I knew it had to be in the filters so I bought some Chemex filters. Before buying the pot, I would clip the filters over a large pyrex measuring bowl (very fancy) to see if I noticed any difference. It tasted so much better! I eventually purchased the pot and have not been sorry. I also own a French press but I always use the Chemex because of the filters. I sometimes get Aldi coffee, but for years I’ve purchased my Colombian coffee (Kirkland brand) from Costco. I buy the whole bean and grind it every morning…makes a big difference! The filters can get pricey, usually about $9.00 for 100, but if you only make it once a day it’s not bad IMO. I think coffee made with a Chemex tastes better. 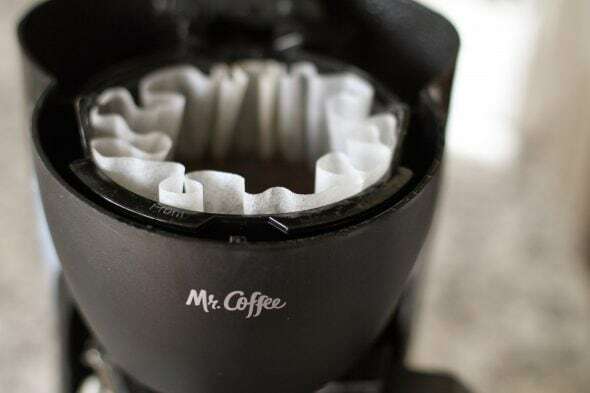 I buy the fabric coffee filters from Mighty Nest and like them. After they seem permanently stained from the coffee, a little bleach makes them look like new. I doubt if I am saving money, but I like those. Grounds go in the compost pile. This was so fun to read. I started drinking coffee at 27 and soon needed it daily. I became more discerning about what coffee I liked over the years and about six months ago started ordering fresh beans from a roastery on the other side of the country. Not frugal! But about two weeks ago I decided to quite coffee. Hopefully for good. It has been affecting my sleep and how I feel. I’m a slow caffeine metabolizer and it takes a long time to get out of my system. I’ve been having heart palpitations as a I fall asleep and once I quite coffee they went away. For now I’m not even getting into de-caf – just have a mug of hot water and lemon if I feel the urge. I have better energy in the afternoon off of coffee/caffeine. Hopefully this change sticks! Rachel, same here. I quit caffeine last year because of heart palpitations at night and trouble sleeping. The palpitations freaked me out so much I quit cold turkey–coffee, tea, diet cola, and even chocolate. Now my hot drink of choice is lemon ginger tea. I feel so much better these days! The phrase “a nice cup of tea” does sound comforting. Coffee makes me optimistic about the world and life. I love the taste, smell, holding a warm mug. I like it black or with a splash of cream, milk, almond, cashew, or coconut milk. It’s not a bad way to start my morning. That said, I’m curious to know why the switch to coffee after so long with chai (another one of my favorites)? I don’t drink coffee at all. I am in my 60’s and have had a half a cup in my entire life. I was in Alaska, and freezing, and it was the only hot drink they had. I don’t like the smell either. It is one of those things, I could barely get it past my nose to my mouth. Now tea, hot chocolate, even hot water with lemon and/or ginger. Those I will drink. High fives for coffee! I bought a reusable filter (probably from Amazon) over 5 years ago and it’s still going strong – I can wash it in my dishwasher too – even less trash/compost! I also love chai tea but drink mine with honey and a splash of vanilla coffee creamer instead of heavy cream. It’s amazing! Have you tried cold brew? It’s my favorite during warm weather. I keep a pitcher in my fridge and drink it over ice with sweetened almond milk. Glorious!! Ohh, I don’t worry about making him cringe! Pretty much everything about my coffee drinking habits is anathema to him. Oh Naomi, I am not a coffee drinker anymore but that made me wince – when I was a kid my gran would add bicarb soda to the green beans to keep them ‘green’ after cooking them to a point a resting fork would sink in to them…uughh! At my workplace, the ladies of a certain age and culture used to put actual salt in with the grounds “to prevent bitterness”. To me, it did not really do anything regarding the bitterness. Probably not good from a health standpoint to use sodium products, but we all have our own preferences. I can believe that! I’ll give it a try. egg shells help reduce the acidity too…rinse/clean them, bake them in the oven briefly to kill any lingering stuff, crush them up, and add them to the grounds. I never drank coffee till I was in my 40s; I started with lattes because I wanted to “treat” myself while on Weight Watchers and that was an inexpensive treat with minimal points. I occasionally drink coffee now–well, I like a little coffee with my cream, haha. I’ve always been a tea drinker but I do find that sometimes the caffeine kick from coffee is handy (I like my tea strong and black but it doesn’t do the job as quickly as a cup of coffee). I find that hazelnut coffee tastes less bitter to me. Thanks for your tip about Aldi’s coffee–I’ve wondered about them! You are way ahead of me. At age 71 I still can’t even eat coffee flavored ice cream. Everyday coffee drinkers here. I order the 3 lb. bags from the San Francisco Bay Coffee Company. https://www.gourmet-coffee.com/brands/sfb.html They sell it at Costco, but we no longer live close to Costco. So, I guess I am a mid-level coffee snob. I brew one pot every morning and I drink 2 cups and dh takes a travel cup to work. Very occasionally, we will make decaf. with dessert or later in the day. I don’t grind my own beans and we use a paper filter, so not legit, but EASY! I will say that part of the joy in drinking coffee is drinking it with friends/family and even if you go out to Starbucks, it is still cheaper than going out for a meal. And if you have a registered card, you get a FREE drink on your birthday! “Tasting notes of . . . Mrs. Butterworth!” Too funny! Well that is a good point — Starbuck’s is cheaper than a meal out — and I do love sitting there! Yes! Vietnamese coffee is delish! Kristen I think you’d love that! I’m a coffee nut and love the taste of a well crafted artisan coffee. One thing I found helpful when trying to remove the sugar & cream from my daily cup is to look at the notes in your blend. I found, for myself, that beans with higher acid content and citrus notes tends to need more sugar for me to enjoy it. I tend to like bitter notes so I always go with something that has a chocolate or vanilla note (not added flavor, just the bean’s profile). If anything in your town offers taste flights (like Starbuck’s Reserve) it could be a good way to figure out what blends & brew styles you enjoy more with less sweeteners. Also, if you want to indulge a bit, I highly recommend Stumptown blends! Coffee is super smooth and they have several different blends that stand up great on their own. Great link, Petra — thanks! Does anyone find decaf available at Aldi? I like their coffee but can’t drink regular anymore due to heart palpitations caused by caffeine. I’m so bummed that I can’t find decaf at either of the two Aldi stores near me. Wah. Nope! I’ve looked and looked but there’s no decaf except in the powdered instant coffee. I do! I’m in southeastern Michigan and get decaf from Aldi all the time. I brew half caffeinated, half decaf. They don’t have decaf in the large containers, but have it in small ones for less than $3. Yeah, we have several kinds of decaf at our Aldi. 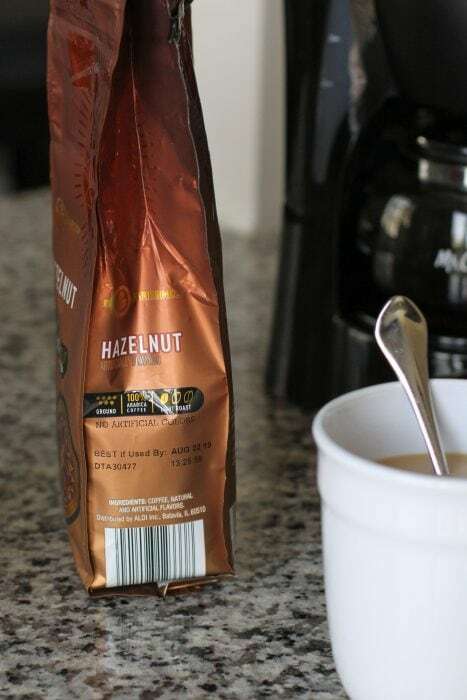 (I think “donut shop blend”, which I buy, and regular, maybe hazelnut) Does anyone know if you can ask your Aldi manager to order certain things? I think that the best-tasting coffee at Aldi is the German-roasted stuff, which comes in a brick. I like the regular (not mild) brew. Here is a picture: https://www.thekitchn.com/the-best-5-you-can-spend-at-aldi-249647. Ooh, I will look for that! I wish I had an Aldi. I miss German coffee (and self stable milk) so much. It’s where I learned to drink coffee without any sugar. I thought I was a coffee snob after 9 years in Seattle, but 2 years in Germany set me straight. They KNOW how to make a good coffee. I would recommend adding 1/4 tsp of cinnamon to the coffee grounds before brewing. It was my experience that it cut the bitterness to the extent that I never needed cream in my coffee again! Your mileage may vary, but it’s worth a shot since cinnamon is a lot healthier than cream. I have to agree with Joshua and say that I really dislike Aldi’s coffee (the unflavored stuff- I have syrups to make it flavored on my own) but Wegmans store brand coffees are phenomenal. If you get out to one, try the coffee. Both the regular grind and espresso roasts are excellent! I first tried good coffee at a farmers market and have been a fan ever since! I always “used to like the smell but not the taste,” but for me, good locally roasted coffee has been the secret. 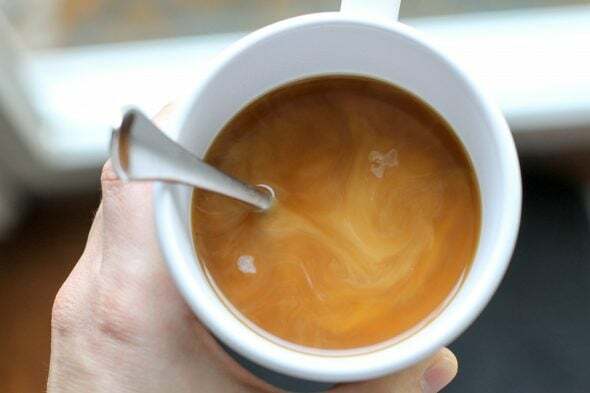 I still add cream and sugar to not-so-good coffee, but my everyday coffee is black! Coinidentally I had sworn off coffee the past 3 years after a lifetime addiction since the very strong Iced coffee at Star-broke’s was too acidic. Just this last week I let coffee back into my life, after strictly tea and some decaf. Like you, I am happy not to be addicted but it sure tasted good! So true — so much cheaper at home. I do love to sit and sip and read at Starbucks but have seriously cut that habit. Now it’s an occasional indulgence on a weekend when there’s time to enjoy it instead of a daily I NEED IT NOW! Enjoy! If you use a French press, you won’t even need filters! And French press coffee takes less time than a coffee maker or drip. Depending upon where you buy coffee, you might also be able to save money if you grind your own (freshly ground + French press = the mellowest coffee around). My husband loved Aldi coffee! I always got him the interesting flavors they came out with a few times a year and he’d get disappointed when he loved one and we couldn’t get it again. He likes it with flavored creamers and, again, he loved the Aldi ones! Unfortunately we don’t live anywhere near and Aldi anymore and coffee and creamers are far more expensive elsewhere! He still drinks it, we just stock up and buy a few if its on sale. He uses a Keurig and we bought some reusable K-cups for it. Sometimes we’ll buy the actual K-cups but he prefers the reusable ones. With them we have very little waste as well. We also have a regular coffee maker and when the Keurig goes out we’ll dig it back out because I don’t see the point of replacing the Keurig. I kept it to use when we had people over and needed a full pot. It works better than newer ones family members have bought, they always seem to get grounds in their coffee, and was very inexpensive. I got it when I lived in my first apartment in college because I felt like I was a grownup and it’s something all grownups have! It’s still a great coffee maker but I haven’t gained a taste for coffee in the last 17 years! Growing up on a dairy farm, I never did care for milk. So I’ve been drinking coffee for as long as I can remember, with milk. Nowadays I like 18% table cream, yes, please! But 10% will do. We have a Hamilton Beach duo coffee maker: one side brews a to-go cup with a built-in mesh filter and the other makes a 12-cup pot, with paper basket filters. We grind our own, which we keep in a glass jar on the counter. I like mixing unflavoured coffee with some hazelnut-vanilla beans. Also, I’ve been making my own chai-spice mix and also pumpkin-spice mix, either of which can be sprinkled on the grounds before brewing. I very much enjoy the smell of fresh-brewing coffee and I like to drink it as fresh as possible, hihi! A few years ago I got off coffee for quite a while, was enjoying all kinds of teas, now chai tea is my favourite. Now I’m back on coffee, usually high-test in the morning and decaff after that. 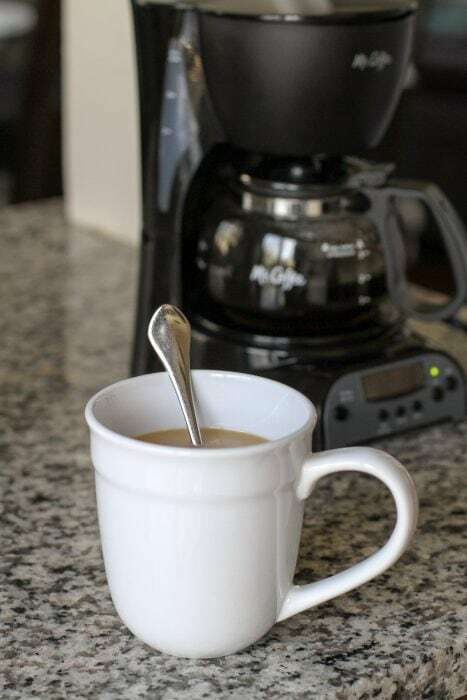 One place I worked greatly added to my coffee consumption, as a fresh pot would be brewed throughout the day and naturally it smelled too enticing to just walk by… but it did give me the jitters. When I was pregnant with our first child is when my sensitivity to caffeine showed up. Wow. Drank two cups of good strong coffee and could feel my pulse in my fingertips. Hormones–they do all kinds of strange things to you! Mmmm… I could definitely become a regular coffee drinker. I like it with milk or cream hot or cold. A dash of cocoa and hint of sweetness is always a welcome touch as well. Black coffee works too. If my husband drank it I probably would as well, but he doesn’t, so we don’t. 1. I’m too cheap! We don’t have a coffee maker or beans or filters and since I would be the only one drinking, it’s simply not worth it. 3. Coffee breath. It’s like garlic. If everyone has some, it’s fine! I do love that you wrote a post about your newly acquired coffee drinking! Love reading the comments as well. Kristen, I love your blog!! I am a fan of Aldi coffee too!!! I spend a little extra for Gevalia Chocolate Mocha (it will go on sale for 5.99)- I will add a little cocoa powder (make sure you dissolve this with a little bit of hot coffee first so it is fully incorporated) and half and half or heavy cream – it is divine! Coffee is one of those things that would probably help me a lot in social situations but I just can’t like it. I don’t drink tea either. I guess I’m just not cut out of drink hot drinks. I hate hot coffee, but love Iced coffee. Yes! We love the Aldi coffee too. French Vanilla is our usual daily flavor but I do buy the seasonal flavors sometimes. Some have been good, others just ok. But it’s fun to try one here and there. Plus, sometimes the seasonals get marked down super cheap! 99 cents! Oh no, coffee snob here. I don’t like flavored, I grind my own beans, really picky about what beans I buy, really picky. Love Lucy Jos coffee and Subtle Earth = yummy. Kroger offered a free Stoks Cold Brew and that changed my thoughts about coffee. I cold brew now. Super simple and if you want it hot then just heat it up. Cold brew eliminates the bitter and really brings out the flavors in the beans. Easier on the tummy too. Oddly enough since I switched to cold brew I don’t want to have more than 1 cup of coffee. I buy a large bag of Starbucks beans from Costco and brew at home. Huge cost savings compared to the 7.99 bag of 10 ounce Starbucks in the grocery store. Costco has several types of bagged beans. They have an industrial sized coffee grinder just beyond the registers, so I grind the whole bag at once for the purpose of convenience. We received a traditional coffee maker as a wedding gift and may have used it a few times. We got a knockoff Keurig for Christmas…..I suddenly increase my coffee intake. I still don’t drink it every day. I love the coupons for coffee and creamers. I also like my free samples. Lesson learned: save the Starbucks 2x the caffeine for road trips…didn’t sleep well for two days after drinking it. I don’t do a lot of caffeine. The knockoff Keurig also comes in handy because my husband and I are not up typically at the same time in the mornings. I love the ritual surrounding my morning cup of coffee and have done so for a really long time. I grind my beans – SF Rainforest Organic Blend from Costco – in a $20 Braun grinder I’ve had for years. Pour over is the way to go, one cup at a time, so there’s none of the bitterness you can get from a pot that’s been sitting awhile. Nothing wasted! Grounds go into compost, filter and all. I can’t imagine the morning without it! I never thought I liked coffee either. What I didn’t/don’t like is HOT coffee. I grew up in S. Florida. Lots of people drink iced coffee year round. I started drinking iced 10yrs ago, and I love it now. I brew a pot of hot coffee. Add it to a pitcher with sugar free syrup( vanilla or caramel) and half and half and then refrigerate it. It lasts me for about 3 days. I also make ice cubes( we do have an ice maker, but I like big cubes) with the vintage aluminum ice cube trays( the type with a lever). Those make big cubes that don’t melt as fast. I use Tervis Tumblers and stainless steel straws( bought on Etsy) for my iced coffee. I like whole beans, ground fresh. You can often find bulk coffee beans for cheaper (and less waste). During warmer months, cold brew coffee is amazing! I can barely get myself to drink hot coffee, but iced cold brew is pretty dang good. Coconut milk is my favorite add-in; very creamy and smooth! I wasn’t a coffee drinker for years, but when I started enjoying it I needed sugar and cream. I’ve cut back on the sugar by having my first cup with sugar and the second cup with half as much sugar. Once you’ve broken in your tastebuds with that first cup it’s easy to reduce the sugar for the second cup. (If you’re having a second cup!) Now, I’ve reached the point where I don’t need the sugar and just add a splash of milk. I should try that! Right now, I definitely am loving the sugar. Not tons, but more than none!